When 2018 arrives, the Corvette will enter its 65th year as Chevrolet’s sweetheart sports car. Living a lifetime marked by both prosperity and adversity, the Chevrolet Corvette underwent adjustments through seven generations as culture assesses the modern automobile. The increase reliance on electrification, fuel management and customers favouring other vehicle types has resulted in a global auto market that may not be kind to a rear-wheel drive, V-8 engined sports car. When the 638-horsepower Chevrolet Corvette ZR1 was released between 2009 to 2013 there were even thoughts that classic American sports car philosophies would not translate into succeeding examples of the vehicle. Some of this concern was alleviated by the roll-out of the seventh generation Chevrolet Corvette and the Z06 featuring 650 horsepower of old-fashioned performance greatness. Proceeding into the 2019 model year, the future of the automobile will involve Corvette’s most treasured qualities extended to new levels with an all-new ZR1. The 2019 Chevrolet Corvette ZR1 is a glorious, new centerpiece for the prime performance capabilities led by an evolutionary new engine. Operating through an intercooled supercharger, a 6.2-liter V-8 LT5 engine generates a quantity of power no factory production Corvette has seen. Serving as a performance record for the American sports car, a SAE-certified 755 horsepower of momentum will be on-tap with the new ZR1 model. Torque production of 715 lb-ft is also supplied to rear drive wheels when the driver presses the accelerator. The 2019 Corvette ZR1 powerplant will also house General Motor’s first use of a dual fuel injection system. Low pressure port injection and high-pressure direct injection will push gasoline into the eight combustion chambers of the LT5 engine. This fuel injection combination concept has popularly been found with the powerplants of the Subaru BR-Z and Toyota 86 sports cars. On those vehicles, the dual fuel injection setup utilizes port injectors for improved performance under lighter load conditions and direct injection for enhancing the engine’s compression ratio. It’s unclear precisely how similar the 2019 Chevrolet Corvette ZR1's LT5 power unit will function with dual fuel injection. Finally, the high-performance LT5 engine and the ZR1's drivetrain are supported by a total of 13 heat-exchangers promoting extensive cooling efficiency. A familiar manual transmission is once-again returning to the Chevrolet Corvette ZR1 for the 2019 variant. The seven-speed manual provides the classic notion of sports car performance with the driver finding the challenge of harnessing 755 horsepower as a true reward. A first for the Corvette ZR1, customers are also offered the choice of an automatic transmission. Perhaps a tamer performance driving experience, the eight-speed automatic does include the thrilling sensation of paddle shifting. With the drivetrain set to propel the Corvette to undiscovered heights in speed and acceleration, ZR1 bodywork enhancements builds up the sports car’s already aerodynamic shape. A unique front end facilitates improved air channelling for the array of heat exchanger units. Formed with carbon fiber, the hood of the 2019 Corvette ZR1 incorporates a unique ‘halo’ profile to provide room for the LT5 engine. Two aerodynamic packages will be offered for the 2019 Chevrolet Corvette. 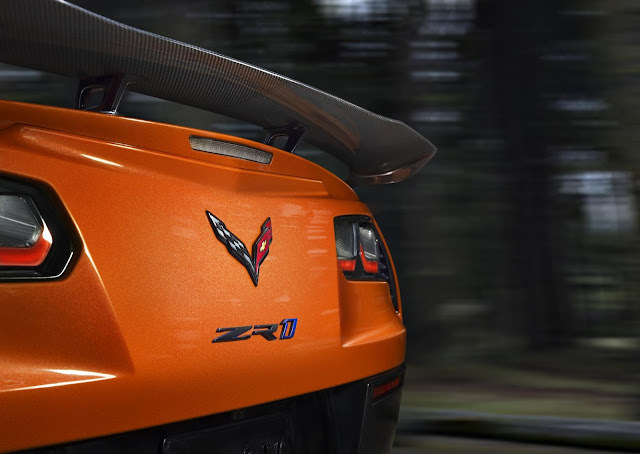 Generating 70 percent greater downforce than the base Corvette Z06, the Low Wing variant of the 2019 ZR1 edition underwent wind tunnel testing and is rooted to the Corvette Racing sports car competition program. Optional with the new Corvette ZR1 is an extensively engineered High Wing package. Delivering an estimated 950 pounds of total downforce to the sports car, the Corvette ZR1's High Wing configuration features two-way adjustability. The High Wing version of the 2019 Chevrolet Corvette ZR1 will also receive additional race track-styled aerodynamic tuning through a front splitter, summer-only Michelin Pilot Sport Cup 2 tires and increased cornering performance with Magnetic Ride Control tuning. Of course, the appearance of the new ZR1 remains important. 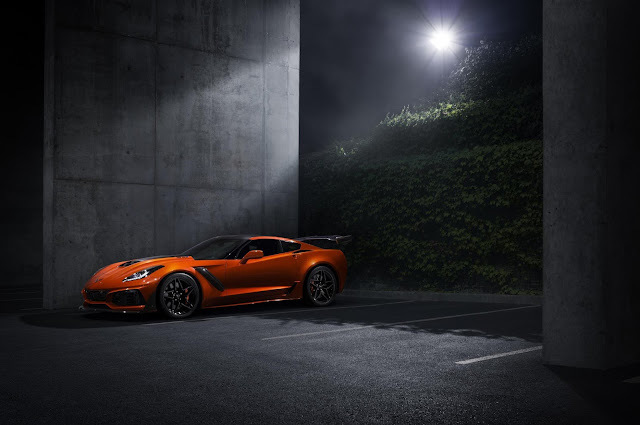 Through an available Sebring Orange Design Package, the 2019 Chevrolet Corvette ZR1 receives added aesthetic attention. Coated with a Sebring Orange Tintcoat body color, orange brake calipers and splitter accent stripes are also included on the exterior. Inside the Sebring Orange Design Package-equipped Corvette ZR1 is orange stitching and bronze aluminum interior trim. Leather seating is standard on the 2019 ZR1 while heated and ventilated Napa leather seats are an option. Actual performance numbers have been released on the 2019 Corvette ZR1 but predictions can easily scale any previous-existing model. Acceleration under the 3-second range appears possible while grip and handling can also be top-notch. The sport car does pledge a top speed potential greater than 210 miles per hour. 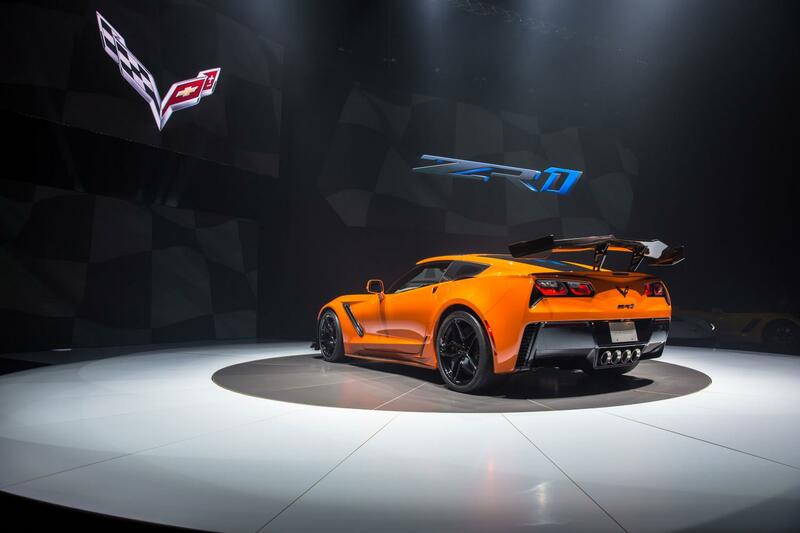 When the 2019 Chevrolet Corvette ZR1 will go on sale for spring 2018, it will be the fourth time the special package would be available since its introduction on the 1970 Corvette. Many Corvette enthusiasts prefer to think of the ‘ZR’ lettering in these high-performance versions as ‘Zora Racer’ named after the man celebrated as the father of the sports car Zora Arkus-Duntov. While the reality is the coding was less poetically produced as a performance package code with no regard to the late Chevrolet engineer, Duntov’s name being memorialized through what is now the fourth iteration of a super-powered Corvette is just too perfect.